We are finding more and more ways of reusing items and resources, reducing the demand we make on raw materials, saving energy and helping protect the environment. We know that we cannot afford to be a throw-away society and that we need to find better and easier ways of reusing the things we make and the resources we use in their production. We have put in place a number of systems that are designed to extend the working life of parts and components, in some cases giving them new and different applications. For example we have an extensive parts remanufacturing operation and, at a global level, we are seeing hybrid batteries being retrieved from our vehicles and put to work storing clean, solar-generated power. The reuse concept also applies to our mission to conserve water by using as little as possible and recycle any waste created by our production processes. Our attention to detail means that we even make sure the boxes in which our parts are supplied are designed for purpose and can be reused again and again. Indicates the savings due to one type of packaging improvement from our European Parts Centre (2015). Amount of collected rainwater “reused” at our manufacturing facility in France (Aug ’14-Aug ’15). The manufacture of a brand new DPF* comes with a heavy CO2 footprint of 22.6 kg, a remanufactured DPF emits just 3.3 kg (Study Chalmers University, Gothenburg). There are many vehicle parts that can be reconditioned and used again, avoiding waste and reducing the demand on materials to make new replacements. We operate a comprehensive parts remanufacturing programme which takes back used parts from our European retailer network. The returned parts are inspected and reconditioned at a remanufacturing centre, with any elements that have worn out being replaced. The part is reassembled, packaged and made available at competitive prices to customers, so they too can support sustainability. Major items we can handle in this way include air conditioning compressors, automatic transmissions, power steering racks, cylinder heads, engines and clutch kits. 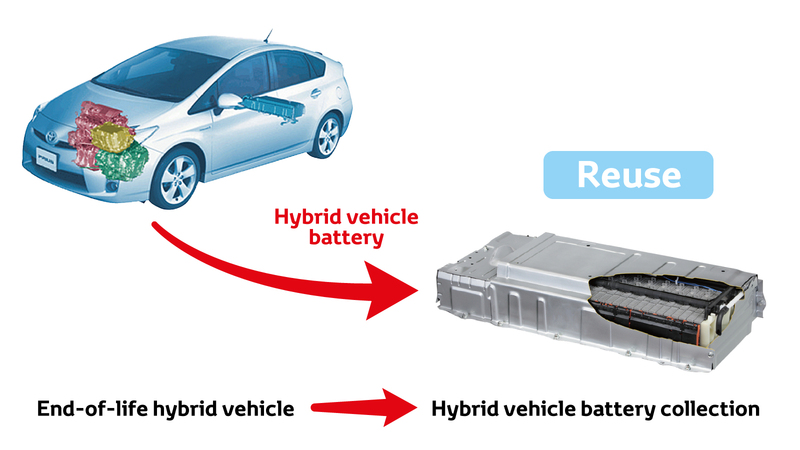 The batteries we use in our hybrids are designed to be reliable and to last the lifetime of the vehicle they power. Even when a hybrid electric vehicle reaches the end of its useful life, new uses can be found for its hybrid battery as it still has remaining capacity. The different types of batteries – nickel and lithium-based – we use in our hybrids are designed to be long-lasting and should never need changing during the vehicle’s lifetime. In fact in many cases they last longer than the vehicles they power. We are looking at how these batteries can be remanufactured for use once again in our vehicles and to go on to serve useful purposes in other applications, most notably as stationary or emergency power storage units. When a hybrid vehicle comes to the end of its life, either naturally or prematurely because of an accident, there is every chance its hybrid battery is still in good working order and ready to serve a new purpose as a useful means of storing sustainably produced energy. Once a hybrid vehicle reaches the end of its useful life, its traction battery may still be in good working order. In such cases, the hybrid battery can be removed and used as a stand-alone, stationary power storage unit. Used in groups, these batteries can hold a large amount of electricity that can be used as part of a coordinated energy-saving system, or even as an emergency back-up supply. Around the world we are already seeing good examples of hybrid batteries being put to work in this way. In the USA they are being used to store solar-generated electricity in an environmental initiative at Yellowstone National Park, and in Japan, Toyota retailers are using a similar approach to provide power for their showrooms. We are investigating the possibilities of this kind of activity in Europe, where currently the number of batteries available is limited due to their reliability. More than 200 hybrid batteries recycled from Toyota Camry vehicles are being used as part of a renewable energy project in Yellowstone, the USA’s oldest national park. Together they form a stationary storage unit that holds electricity generated by the park’s array of solar panels. With a combined capacity of 85kWh, they are comfortably able to supply the power required by the buildings on the Lamar Buffalo Ranch campus. We believe that using the batteries in this way can actually double their useful lifespan, contributing to a system that creates no carbon emissions in power generation, storage and distribution. Solar panels at the Lamar Buffalo Ranch field campus in Yellowstone National Park (US). Re-used Toyota Camry Hybrid battery packs storing energy in Yellowstone (US). A number of Toyota dealers in Japan have started using Smart Green Batteries – hybrid batteries used as stationary storage for solar-generated electricity. Ten batteries from Prius cars are grouped together to store electricity produced locally from photovoltaic panels. This energy is then used at times of peak demand, to help reduce energy costs. Even more efficiency can be achieved when the batteries are used as part of a Building Energy Management System, together with features such as energy-efficient air conditioning and LED lighting. Hybrid batteries have also successfully been used as emergency power storage units in times of national disasters in Japan. Smart Green Batteries recycling end-of-life Prius batteries (Japan). Water is an essential global resource and one that is under unprecedented pressure. We work to minimise the amount we use and to reuse as much of the waste water from our operations as we can. The world’s growing population and increasing agricultural production make water a more valuable resource than ever. Globally, we consider water to be a crucial environmental issue and are focusing on ways in which our business can use less water, reuse, recycle and capture more to reduce the amount we need to take from public piped supplies. We set water targets for our businesses worldwide, taking the different environmental conditions in each country or region into account. These are supported by a wide range of initiatives, from regular water-saving to ways of reusing waste water. In line with our commitment to making sure our facilities have the least possible impact on the environment, we aim to achieve zero water use from public supplies between 2030 and 2040. We are already putting effective measures in place, for example at Toyota Motor Manufacturing France (TMMF) where much of the water needs are met by rainwater saved in on-site lagoons and by effective waste water recycling. As well as using water responsibly, we also take great care in how we deal with any waste water from our manufacturing processes. For example, at our Burnaston factory in the UK we operate an intelligent water management system that not only deals with the waste water the plant produces, it also helps protect the local environment from flooding. 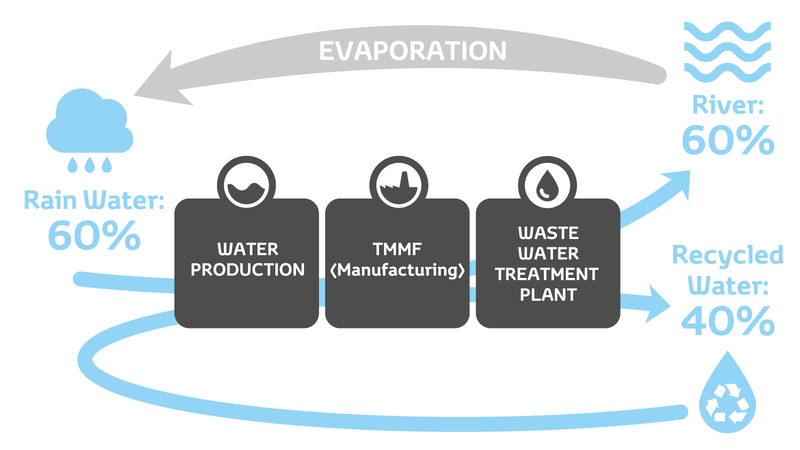 The water treatment process at Toyota Motor Manufacturing France. Rather than recycle, why not use something again and again? Our Kanban “just-in-time” system uses purpose-designed plastic crates for carrying parts to and from our factories. The efficiency of our production operations worldwide is supported by a Kanban “just-in-time” system, by which our many different suppliers provide the parts we need in the right number, to the right place, at the right time. It works using dedicated, reusable plastic boxes and other types of packaging that are designed to hold specific parts so they can be transported right up to the production line in the most efficient way. The boxes are reusable, so there is none of the risk of waste associated with cardboard packaging.